The other day an idea popped into my head to attempt a pinwheel cookie:) Then yesterday I noticed that the talented Linda (Bubble and Sweet) had a pinwheel cookie posted. It's a beautiful cookie! I saw that the pinwheel itself was fondant (she's a fondant master) so I was happy that my pinwheel would be different, as a sugar cookie. I found a template for the pinwheel at http://www.pinwheelsforpeace.com/, but I'm sure any square would do (this was a 4 1/2-inch square). Unfortunaletly, when I made these cookies last night I didn't take photos of the cookie dough during the process. Place the template over the dough and cut around it with a small sharp knife. Transfer the square of dough to the baking sheet. Insert the cookie stick a couple of inches into the middle of one side of the square, and then cut slits into each corner toward the center (the slits above are 2-inches ) with the knife. Fold in one corner from each side (the same corner from each side) and bring it to the center. Press the corner into the center of the cookie and adhere it with a drop of water. I placed small balls of aluminum foil under the raised parts of the dough to keep them elevated through the baking process, for more dimension, but it didn't work that well. Any suggestions? I put the cookie sheet with the unbaked cookies in the feezer for about 15 minutes to help them keep their shape. After the cookies cooled, a white m&m was secured in the middle of each with some icing. The cookies were made with a sugar cookie dough which was divided into thirds. Red food coloring was added to a third, blue to another third and no coloring was added to the last third. The 3 sections were then combined and rolled out. 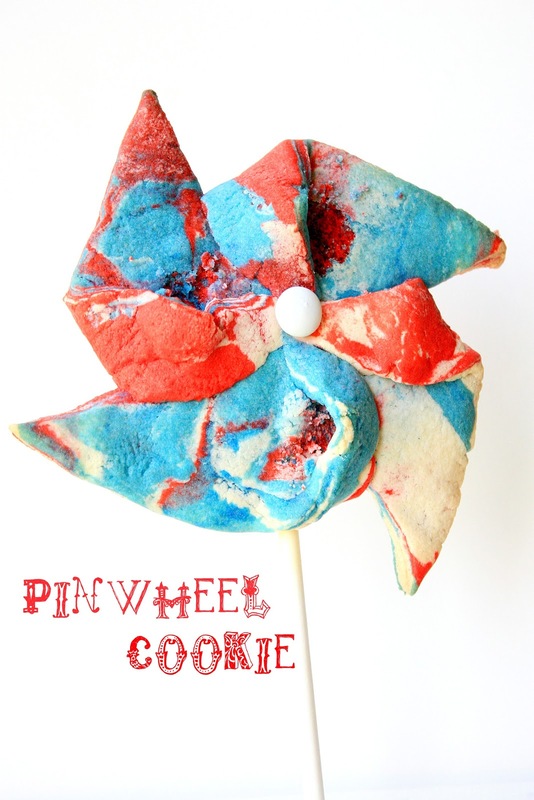 These pinwheel cookies would be a lot of fun for the 4th of July! I just showed my husband these and he's determined to figure out a way to make these cookies spin if I make them. These are fun fun fun!!! The only thing better than the pinwheel cookie that you posted would be one that spins like Natalie said. I have been thinking about a pinwheel cookie lately too. So very clever and fun for the summer. okay these are way too cute!! I love pinwheels, great idea for July 4th!! They turn out really cute! great idea. So perfect for the 4th! These are super cute, what a great idea for a cookie!! What a cool idea. My little guy would love that! Have a nice weekend, Sue! Sooo cute Sue! How perfect for the fourth. Oh my goodness! How fun. You have outdone yourself with this cookie Sue. These look so cool! We tried to make pinwheel cookies but they didn't turn out very well. Yours are wonderful!!! How creative and fun! I would love try those cookies. Sue these are really cute! I love all of your cookie ideas on a stick! I love the ice cream sandwich cookies too. We always make them every summer and i was just craving them the other day! You will have to email me what the Frenchman said! Then again, it might scare me about ever going back! You are just too creative ;p I can't believe you made cookie versions of these!